Martinez opened up Duel 1 with Mekk-Knight Purple Nightfall, Ash Blossom & Joyous Spring, Scapegoat, Effect Veiler, and Magical Meltdown. He activated Meltdown to add Aleister, the Invoker from his Deck to his hand and then Normal Summoned it, adding Invocation from his Deck to his hand with its effect. He Set Scapegoat face-down next, and activated Invocation, sending Purple Nightfall from his hand to his Graveyard and banishing Aleister from his field to Special Summon Invoked Mechaba. He used the effect of Invocation to shuffle it from his Graveyard into his Deck and add Aleister to his hand. Aguilar activated Twin Twisters, discarding Reinforcement of the Army from his hand to destroy Martinez’s face-down Scapegoat and his Magical Meltdown. He Special Summoned Photon Thrasher from his hand next, and then activated Brilliant Fusion! He sent Gem-Knight Emerald and Performage Trick Clown from his Deck to his Graveyard to Special Summon Gem-Knight Seraphinite and then gave up 1000 Life Points to Special Summon Trick Clown back from the Graveyard. He activated Pot of Desires next, by banishing the top 10 cards of his Deck face-down. Martinez Chained Ash Blossom & Joyous Spring to stop Aguilar from drawing 2 cards. Next, Aguilar sent his Seraphinite and Trick Clown to the Graveyard to Link Summon Underclock Taker. He Set a card to his back row before passing his turn. Martinez drew Raigeki! He activated it to clear the field and then Normal Summoned Aleister! He activated its effect, but Aguilar flipped Solemn Strike and paid 1500 Life Points to negate the effect and destroy Aleister. Mechaba attacked directly, dropping Aguilar down to 3000 Life Points. Aguilar drew a card and passed. Martinez drew Ghost Ogre & Snow Rabbit and then attacked directly with Mechaba, dropping Aguilar down to 500 Life Points. Aguilar activated Union Hangar and added B-Buster Drake from his Deck to his hand. He Set it and then passed his turn. Martinez drew Scapegoat and Set it. He attacked the face-down B-Buster Drake with his Mechaba, destroying it in battle. Aguilar used his Buster Drake’s effect to add a C-Crush Wyvern from his Deck to his hand. Aguilar drew a card and Set a monster. Martinez drew Solemn Strike and Set it. He attacked a face-down C-Crush Wyvern with Mechaba to destroy it. Aguilar Set another monster and passed. 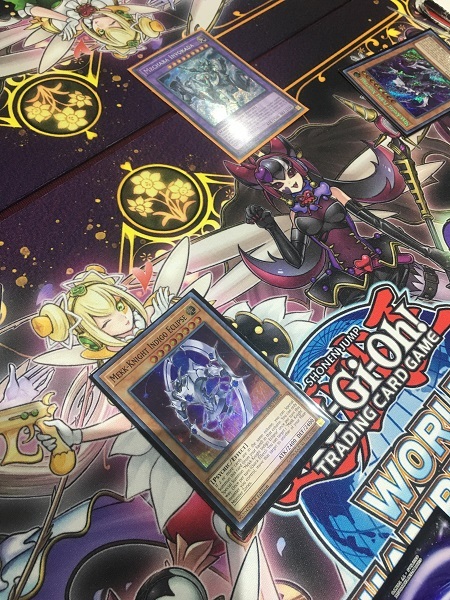 Martinez drew and activated World Legacy’s Memory to Special Summon Purple Nightfall, then he used its effect to banish it and add Mekk-Knight Indigo Eclipse from his Deck to his hand. He Special Summoned it to the field and then attacked a face-down Ash Blossom & Joyous Spring with Indigo Eclipse to destroy it. A direct attack from Invoked Mechaba ended the Duel! 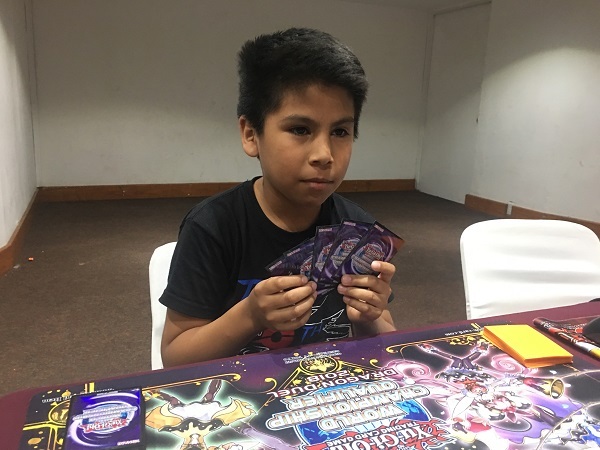 Alan Leonardo Martinez Capetillo is just one victory away from winning the 2018 Central America Dragon Duel World Championship Qualifier! Aguilar started off Duel 2 by activating Union Hangar to add A-Assault Core from his Deck to his hand. He Summoned it and then used the effect of Union Hangar to equip it with a B-Buster Drake from his Deck. He Set a card to his back row and then passed his turn. 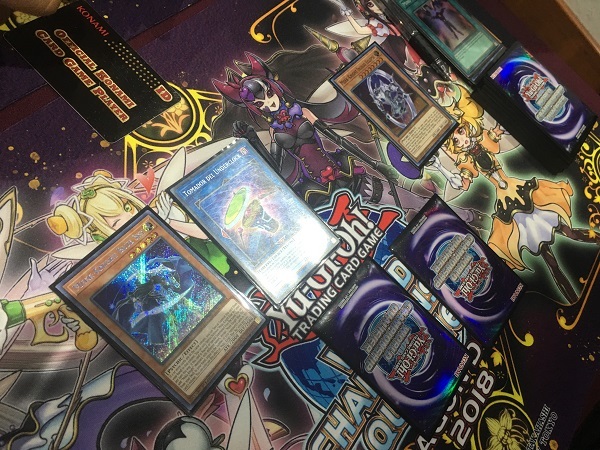 Martinez opened up Duel 2 with World Legacy’s Memory, Solemn Strike, Mind Control, Mekk-Knight Indigo Eclipse, Instant Fusion, and Mekk-Knight Blue Sky. He drew a card and Aguilar flipped Anti-Spell Fragrance. Martinez Special Summoned Indigo Eclipse across from A-Assault Core and B-Buster Drake and then used its effect to move it to a different zone. He Special Summoned Mekk-Knight Blue Sky across from A-Assault Core and B-Buster Drake next, and then Set Solemn Strike, Instant Fusion, Mind Control, and World Legacy’s Memory. He ended his turn. Aguilar Set a card to his back row and then Set Performage Trick Clown. He attacked Blue Sky with his Assault Core, and then sent the equipped Buster Drake to the Graveyard to protect the Assault Core from the battle. He then used his Buster Drake’s effect to add C-Crush Wyvern from his Deck to his hand. Martinez drew Mind Control and then flipped World’s Legacy Memory; but Aguilar Chained Ash Blossom & Joyous Spring from his hand to negate it. Next, Martinez flipped Instant Fusion, paying 1000 Life Points to Special Summon Thousand-Eyes Restrict from his Extra Deck! He used its effect to equip it with Aguilar’s A-Assault Core and then entered his Battle Phase. He tried to attack with Blue Sky, but realized he couldn’t due to the effect of Thousand-Eyes Restrict. He ended his turn, sending Thousand-Eyes Restrict to the Graveyard and A-Assault Core to the Graveyard along with it. Aguilar Normal Summoned C-Crush Wyvern and Flip Summoned Trick Clown. He combined both monsters to Link Summon Underclock Taker and then banished A, B, and C from his Graveyard to Special Summon ABC-Dragon Buster Linked to it. He activated its effect, but lost out to Martinez’s Solemn Strike! ABC-Dragon Buster was destroyed! Martinez drew Called by the Grave and then Set it along with Mind Control. 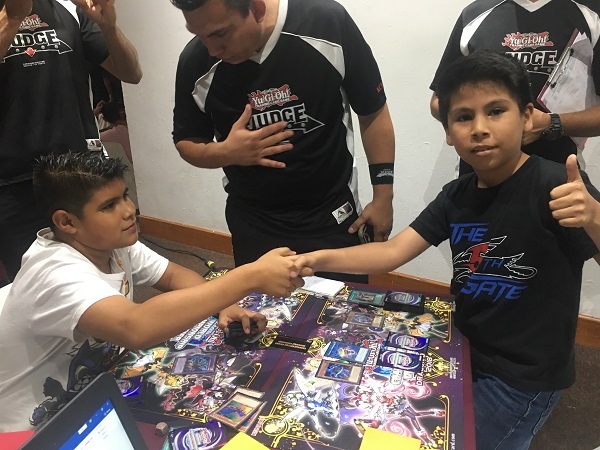 He activated the previously Set Mind Control next, and attacked directly with Blue Sky and Indigo Eclipse, dropping Aguilar down to 3500 Life Points. He returned Underclock Taker to Aguilar in the End Phase. Aguilar Set a card to his back row and passed. Martinez drew Scapegoat and Set it. He flipped his face-down Mind Control to take control of Underclock Taker once again, and then attacked directly with both of his Mekk-Knights, ending the Duel and the Match! 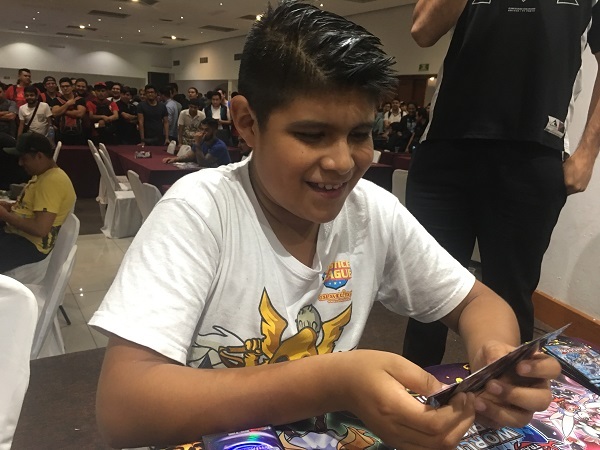 Alan Leonardo Martinez Capetillo is the 2018 Central America Dragon Duel WCQ Champion! Finals Feature Match: Roger Guzman Garcia vs. Edgar Gustavo Tinoco Serrano Central America WCQ Winner!